Subject and Body – default subject and body for the email. IsHTML – specifies whether the Body is in plain text format or HTML. ToRecipients, CcRecipients and BccRecipients – default list of recipients for the email. 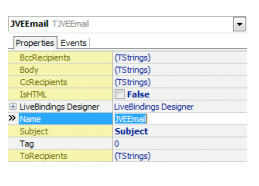 Send – opens the email composition window, allowing the user to send the email. CanSend – use to check whether native interface for email composition, if any, is available. Even if this function returns False, you can still call Send, default email application will then be used as fallback. On platforms, which do not have a native interface, this function always returns True.